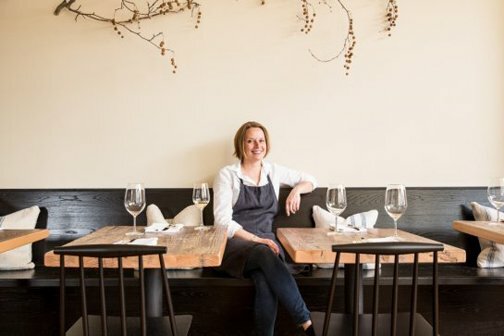 The ultra-coveted Michelin stars for 2017 culinary inventiveness and excellence came roaring into the Bay Area like a meteor shower, with an array of restaurants winning what is tantamount to the Olympic gold in food. A few restaurants kept starts already earned, or increased their star count (a mighty feat, indeed) and some lost a star or disappeared from the firmament entirely. 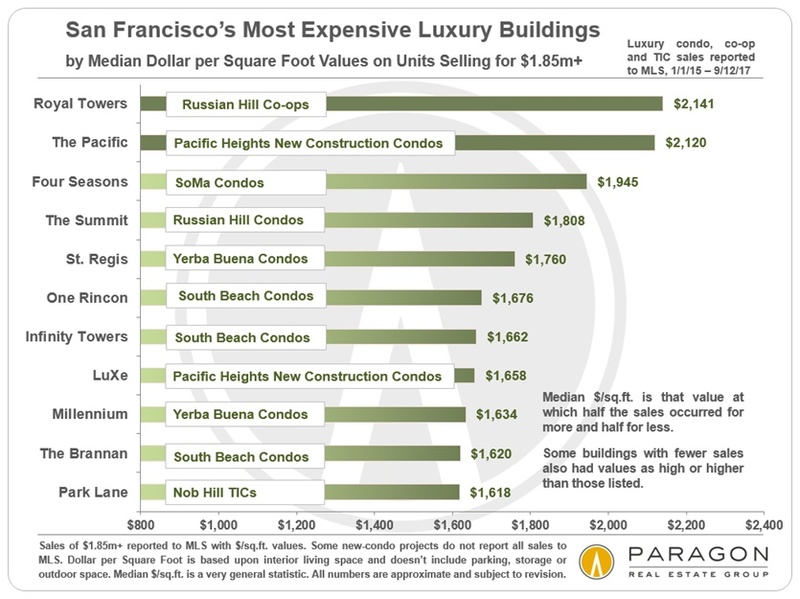 How happy are renters living in SF, the most expensive city in the U.S.? 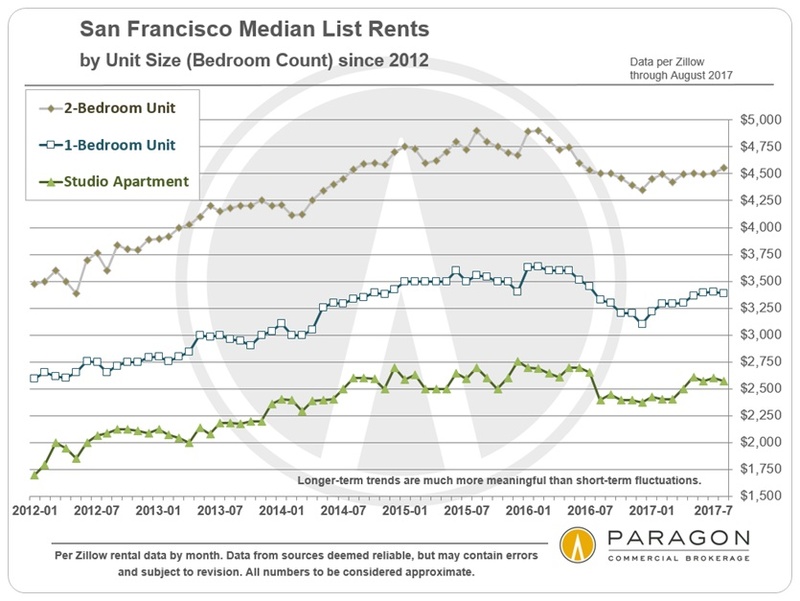 A group of 600 San Franciscans took part (among 14,284 renters in 36 U.S. cities) in a survey conducted by the rental site Zumper. 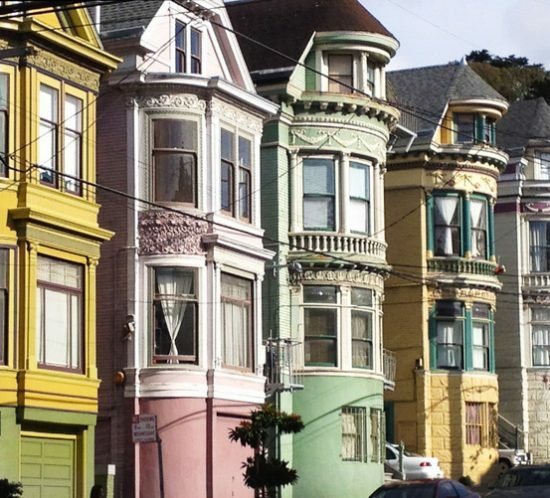 With the results in, it turns out that renters in San Francisco are 4-out-5 happy campers, and are among the most satisfied with their metropolis environs in the country. When asked to rank their satisfaction with SF on a scale of 1 to 5, 49% of the SF survey takers ticked the 5 for the city. Another 31% ticked the city a 4 out of 5. So, we’re up to 80% feeling good about San Francisco. On the other hand, 6% of the SF people surveyed scored the city a 1 or a 2—and they must have some pretty strong beefs with our city to do that. While SF wasn’t at the top in satisfaction, we were 7th overall among the 36 cities. San Francisco is always on the lookout for ways to fund its public services, including the Muni mass transit bus service. One proposal to raise money—among a slew of two dozen other proposals—is to tax one people-conveying industry (Uber and Lyft) to pay for another nonprofit people-conveying service, Muni. According to the SF Examiner, that’s what SF’s Transportation Task Force 2045 has cooked up to fund Muni into the future. The idea is to add on a 20 cents to $1.00 fee on each and every Uber or Lyft ride and maybe a gas tax on top of that. The revenue would go into the transit agencies treasure chest to expand and improve mass transit service. Another idea is to exact a gross receipts tax and a higher sales tax that would impact local businesses and SF citizen consumers. Those who like the gross receipts tax say it would haul in $23 million each year from businesses, but, as expected, local business groups and the tech sector are fighting this idea. Another idea, reports the Examiner, is to put up a sports franchise tax or large event ticket surcharge. 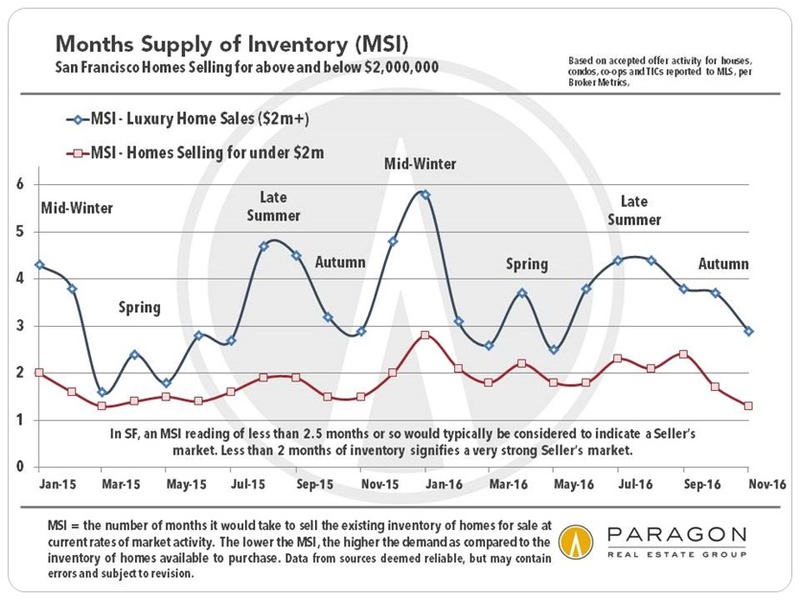 Seasonality typically affects inventory levels, buyer demand and median home prices, often in very significant ways – as is illustrated in the following charts. However, it is not the only factor affecting market conditions and trends – general economic conditions and financial market movements, new construction projects coming on market, significant changes in interest rates, local stock market IPOs, natural and political events, and other factors can and do impact the market as well, sometimes quite suddenly. It is also worth noting that new listings and new sales occur every month of the year – and sometimes, depending on prevailing market conditions and the specific property, buying or selling during the slower periods of the year can be the smart strategy. 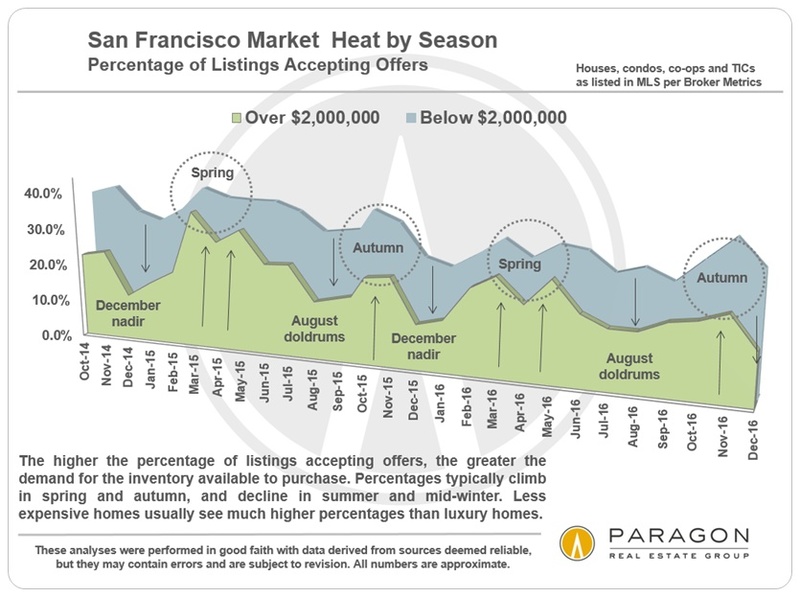 For buyers in particular, though the supply of active listings is somewhat lower during mid-late summer and mid-winter market slowdowns, and the number of new listings dwindles, the competition for homes is much lower as well. 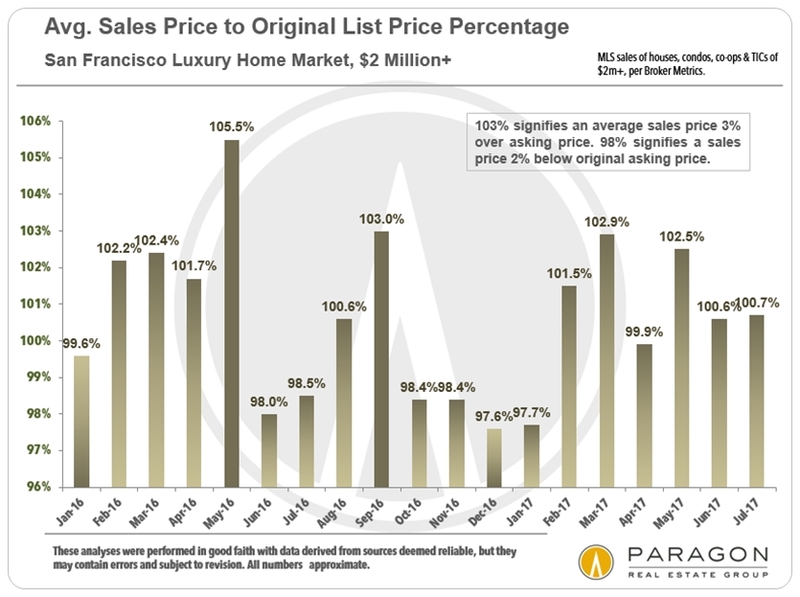 There are many more price reductions and increased seller willingness to negotiate list prices. 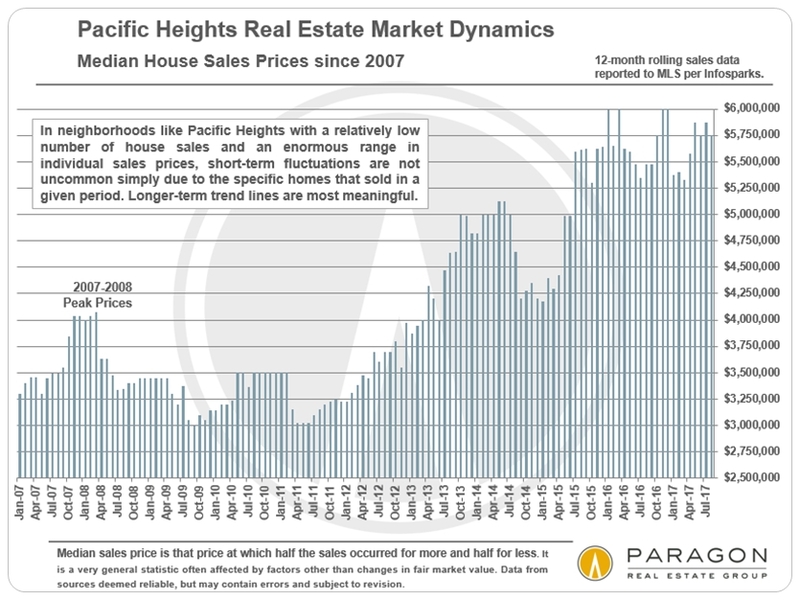 The result is that buyers can sometimes make the best deals during these periods: Many of the charts below illustrate this opportunity. 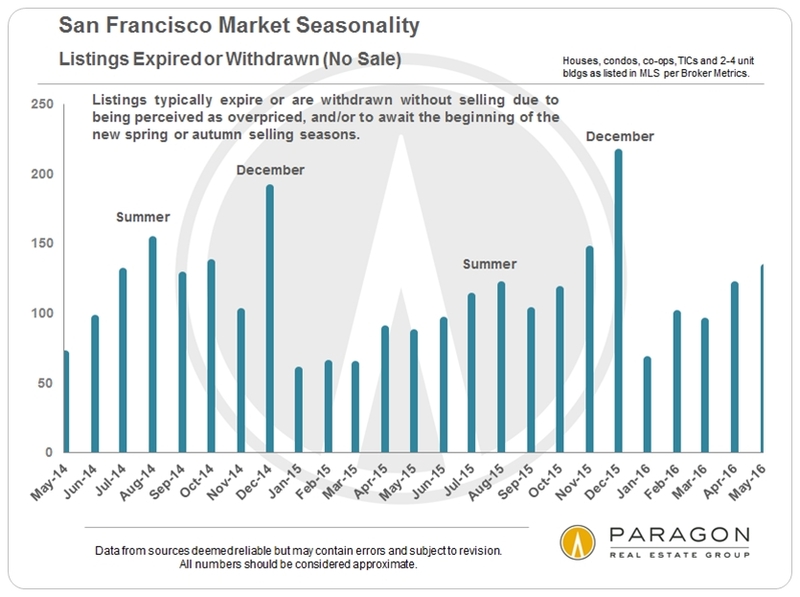 Because of the significant summer and winter slowdowns, it is difficult to come to definitive conclusions about the condition and direction of the market during July/August, and December/January. 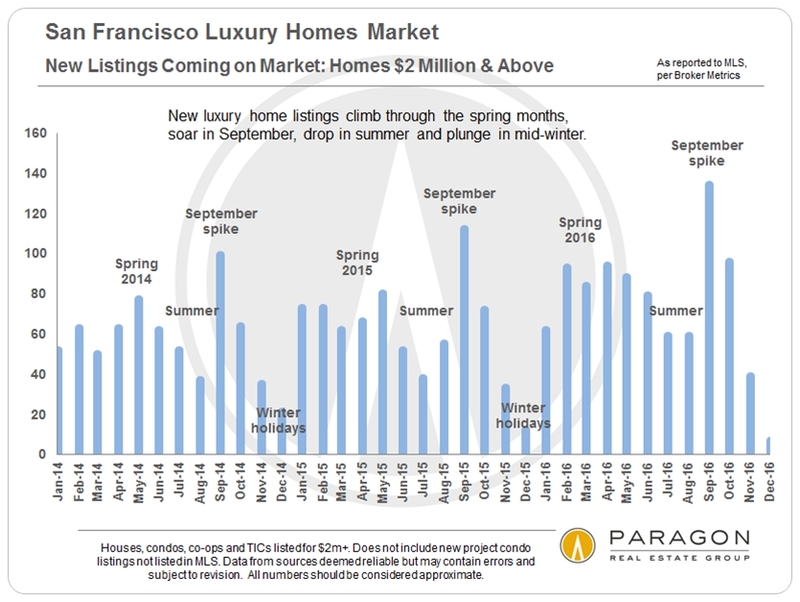 One really has to wait for the autumn market to begin in mid-September with the typical surge of new listings, or the spring market to begin in late February/ early March to get a sense of where the market may be heading next. The devil’s always in the details, and the details of the market change constantly. 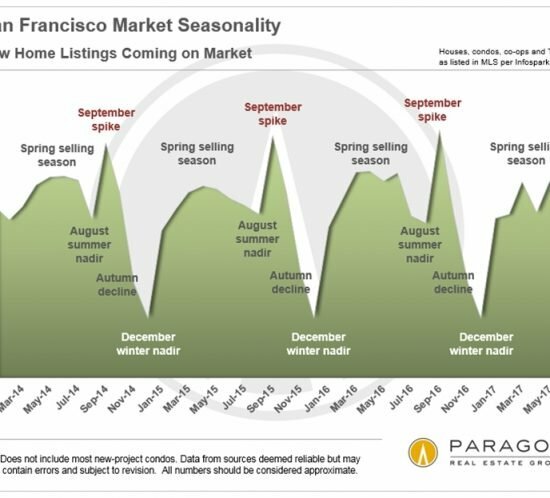 Still, there is a typical and dramatic ebb and flow to the level of activity in the market that correlate with seasonality, and that is what this report explores from a variety of angles. 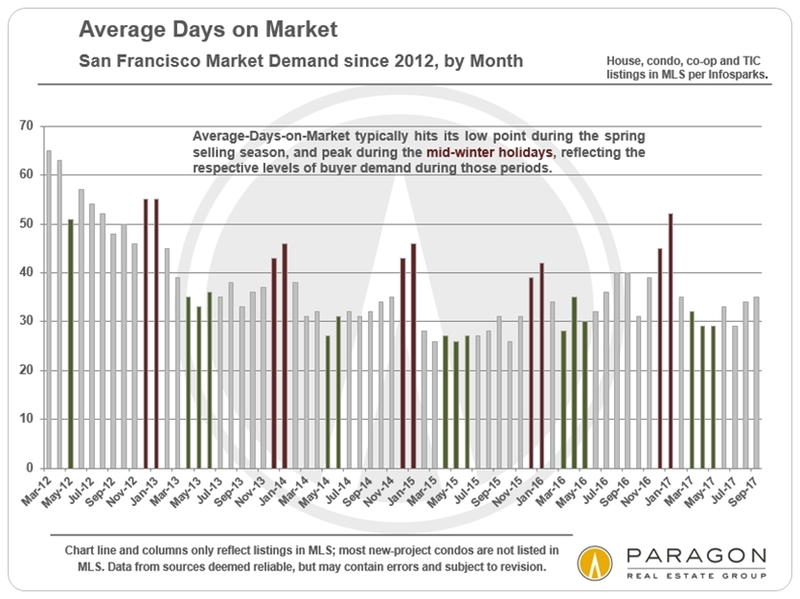 Without inventory and buyers wanting to purchase, there is no market. 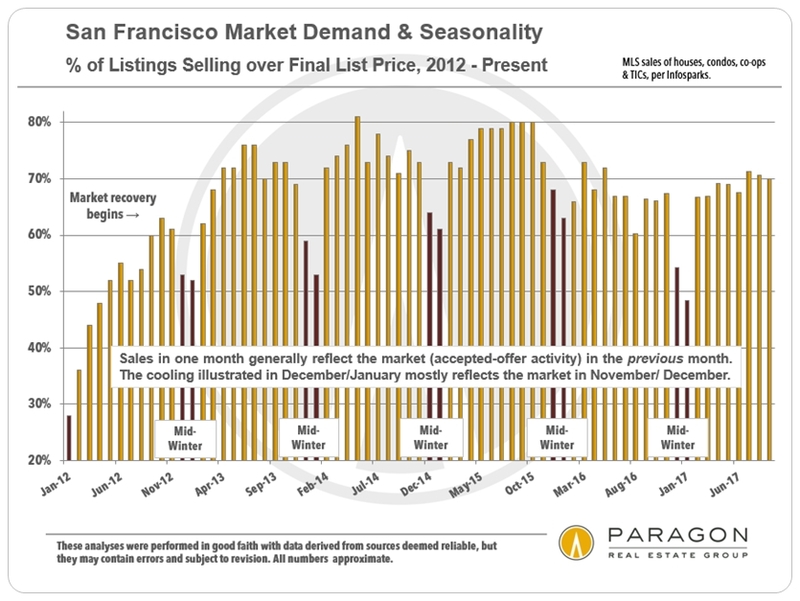 These first charts show the classic effects of seasonality on supply and demand. 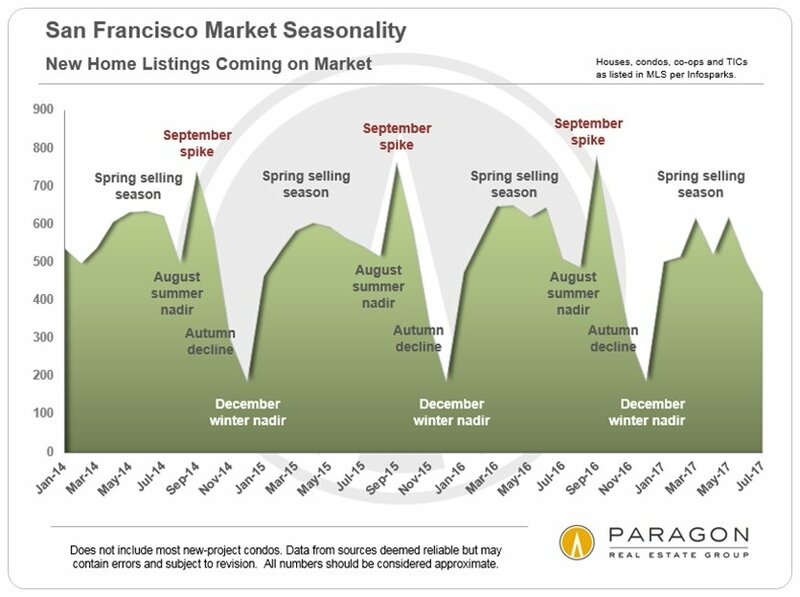 For the last few years, spring has been the season of the greatest market frenzy, which shows up in Sales Price to Original List Price ratio (a good measurement of the competitiveness of the market), and the percentage of listings selling for over final list price..
As seen in these next charts, the higher-price end of the market is usually much more affected by seasonality that the general market. 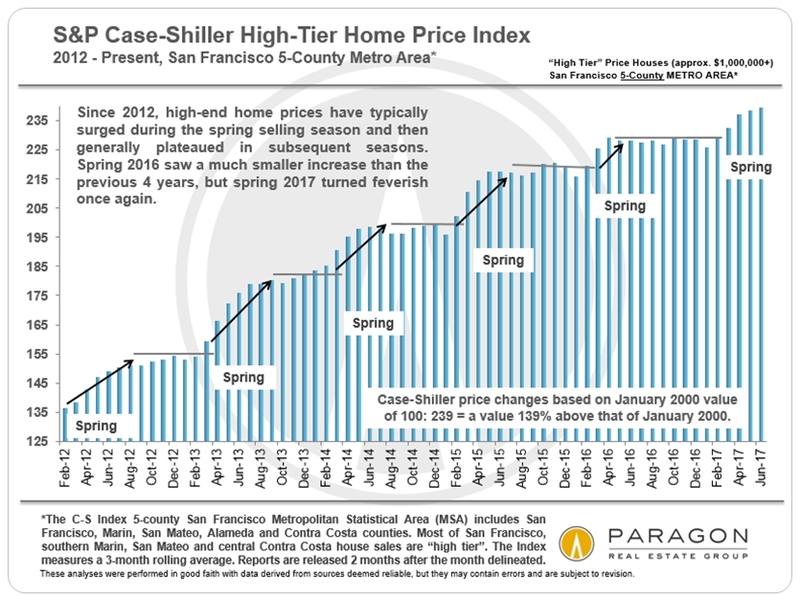 Among other effects, this will usually raise the median sales price during the peak spring and autumn selling periods, and lower them in the slower periods of summer and mid-winter. 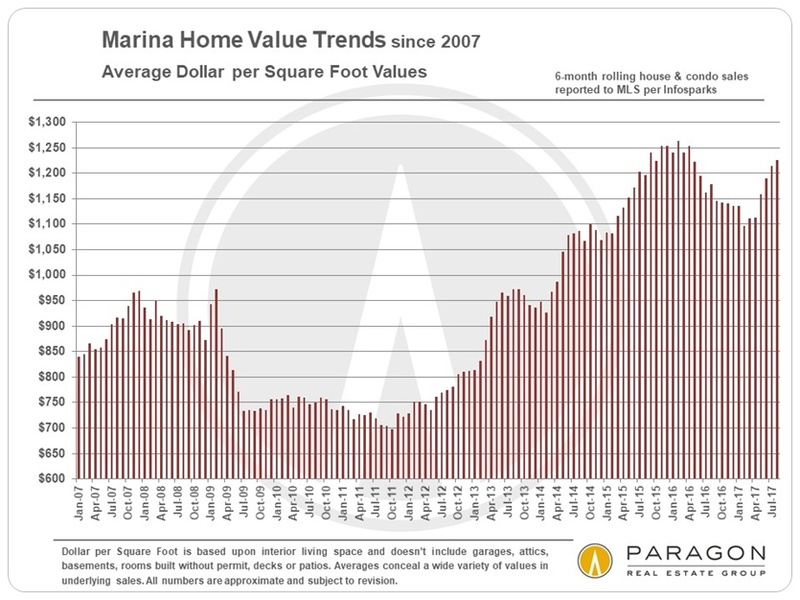 These final 2 charts illustrate both the rapidly appreciating real estate market since 2012 and the shorter term ups and downs that seasonality can play in median home prices – which sometimes have little to do with changes in fair market value. 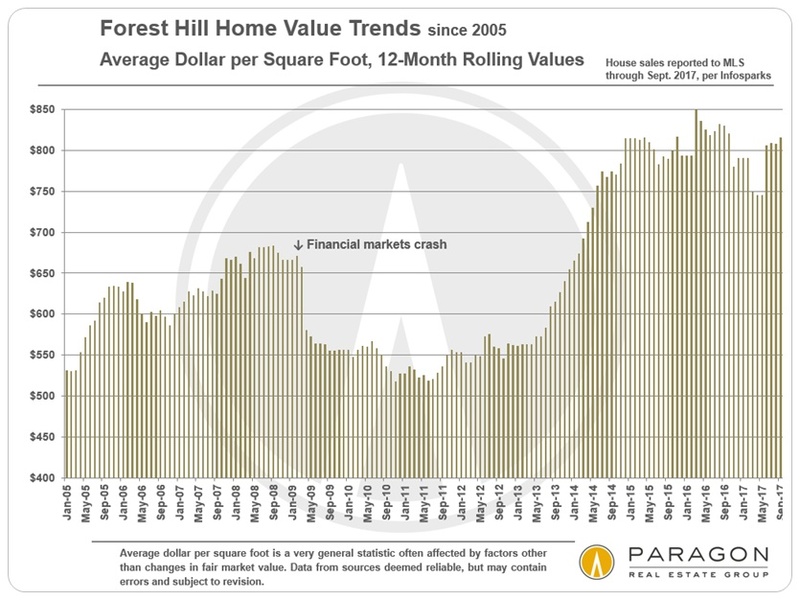 The Case-Shiller Index chart attempts to track changes in fair market value, and the effect of seasonality is dramatically illustrated. 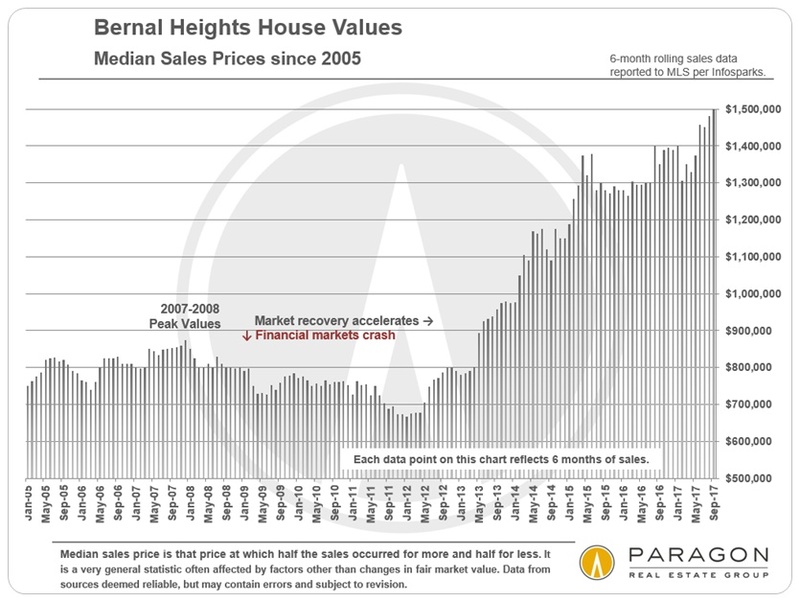 Of course, in an appreciating or depreciating market, there are usually other factors impacting median sales prices beside seasonality – as always, what is most meaningful is the longer term trend in home prices, not short-term fluctuations. 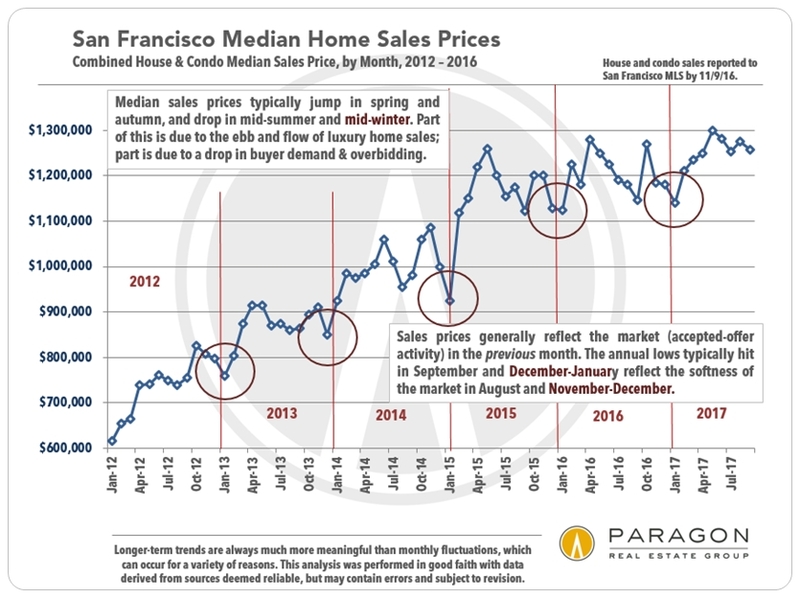 Fluctuations in median sales prices are not unusual and these fluctuations can occur for other reasons besides changes in value, such as seasonality; inventory available to purchase; availability of financing; changes in buyer profile; and changes in the distressed and luxury segments. 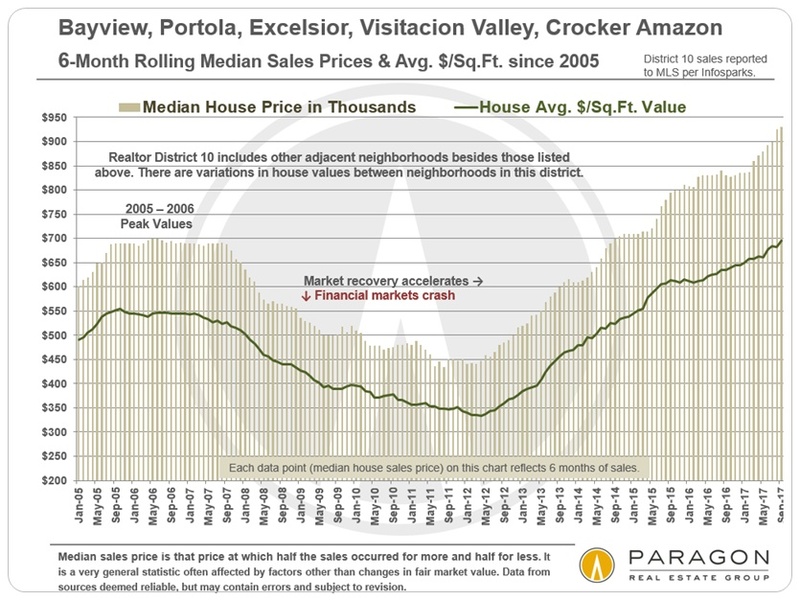 How these statistics apply to any particular property is unknown without a specific comparative market analysis. All data from sources deemed reliable, but may contain errors and is subject to revision. 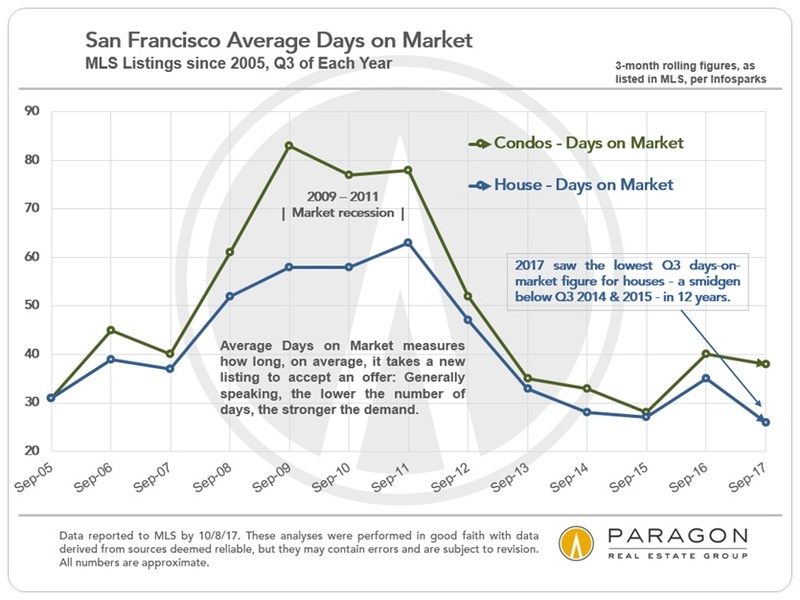 Well…another interesting record for San Francisco. We enjoy having the highest average ticket (traffic) price in the entire U.S. 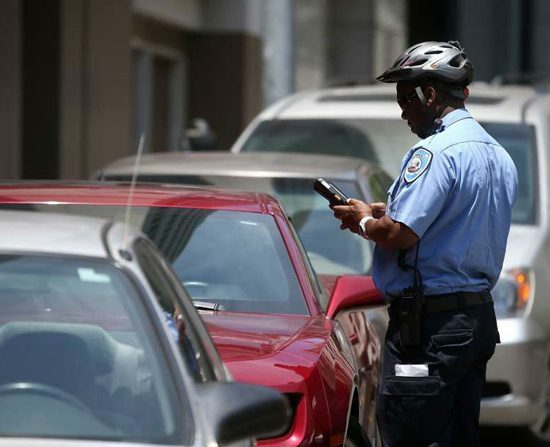 The city’s traffic police blessedly issue us $124 million worth of tickets every year. SpotAngels, a parking startup, informs us of this streetwise fact. So, which neighborhoods are the true ticket bonanzas for our city’s coffers? SpotAngels put together city data with their parking data on parking spot location, regulation and the average ticket price to come up with the following list of most expensive ticket neighborhoods. Coming in first is SoMa with a whopping $11 million in tickets. 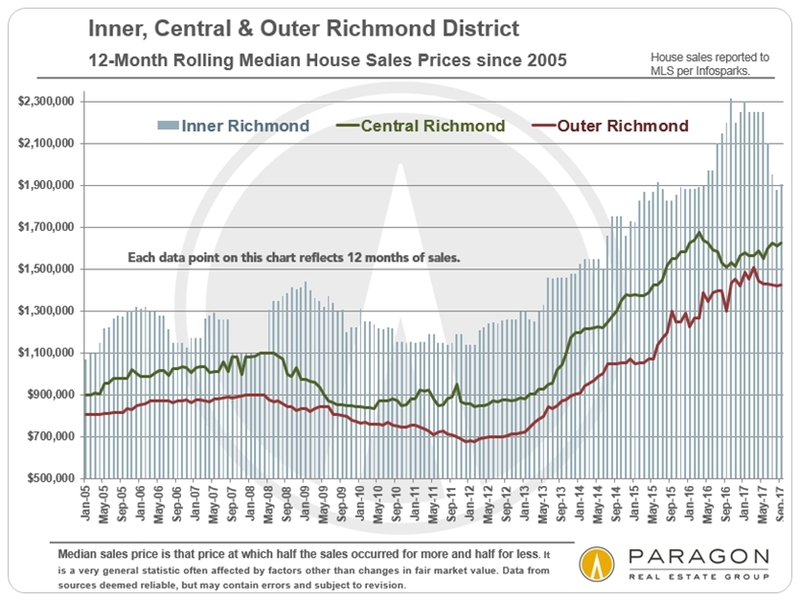 Next is the Inner Richmond at $10.5 million. The Mission is third with $9.5 million. The highest average ticket price is the Civic Center at $108. Right behind that is the Financial District, South of Market and Inner Richmond, coming in at $106 average ticket prices. Alert: All Hallows Eve is here in San Francisco in 11 days, on a Tuesday. Where to go? What to wear? Where to dance? Any good Halloween jokes. Halloween drinks? What’s great for kids? Those are the questions plaguing (get it) us right now and up to Halloween. Many of the big events are on the weekend before the Eve. San Francisco is a killer Halloween party town, awash with all kinds of fetes, feasts and fun ghoulish things to do and displays. Oct 27: International Ball San Francisco at the W Hotel. Biggest and bestest with three separate dance floors and a smashing line up of talent. Oct 27: Demo: Halloween Spider Lollipops & Spider Webs at Blick on Van Ness—for the whole family. Oct. 28: A Nightmare on Van Ness at the Regency Ballroom, some say it’s the biggest Halloween event in SF. Tons of ghoulish dancing fun. Oct. 28: Speakeasy SF Halloween Party Cruise on SF Belle boat cruise, a murderous party on the Bay. Oct. 31: The Rocky Horror Picture Show—Halloween Night at the UC Theater. A cult classic. 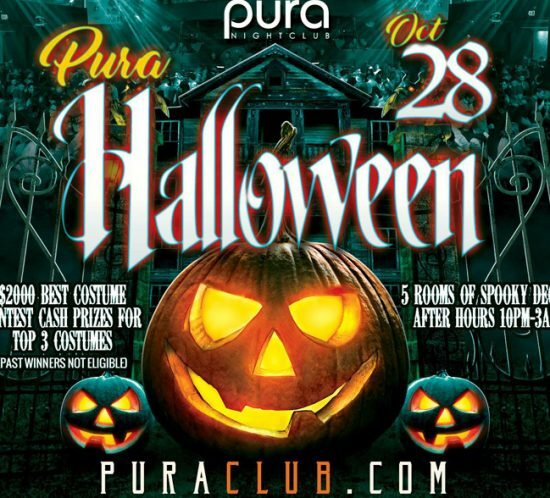 Click here to see the entire list of scarifying Halloween events. 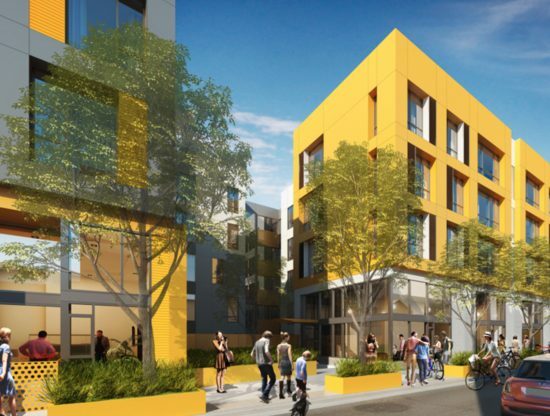 If approved by the SF Planning Commission in October, SoMa will be blessed by another residential building with 185 units of housing. The new four-story building will be located at 975 Bryant Street, with the existing industrial building at that address being torn down. Developer Trammel Crow Residential intends to break ground by summer 2018, and for the building to be bringing in occupants in 2020. However, Trammel Crow is in a stew of controversy in its proposed demolition of another industrial building in South of Market to put up an 8-story retail, housing and industrial space project—that destruction displacing artist studios from the building. This has contributed to a noted and lamented exodus of artists from the city, which is losing its luster as an artists’ metropolis. One artist called it a “dying breed” of creative space in the neighborhood—a process going on since 2003. The new 4-story project at 975 Bryant was chosen for its nearness to Trader Joes and other upscale retailers, and working offices, such as the Airbnb headquarters on the same block, and undergoing its own expansion. 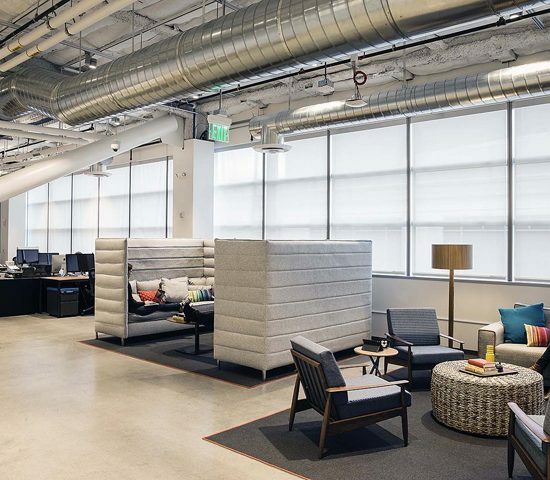 In the world of largest, biggest, hugest, San Francisco just racked up another record: Dropbox just leased the most cavernous office space in the history of the city. It clocks in at 736,000 square feet. Dropbox, a file hosting company, took the entire Exchange in Mission Bay—a coup for developer Kilroy Realty Corp which had absolutely no tenants for the $570 million, four-building development going up at 1800 Owens Street. This lease—going for 15 years—leapfrogged over the recent Salesforce leasing of 714,000 square feet at Salesforce Tower. And this follows six-figure office space leasings in the city by Facebook, Amazon, Alphabet and Google. 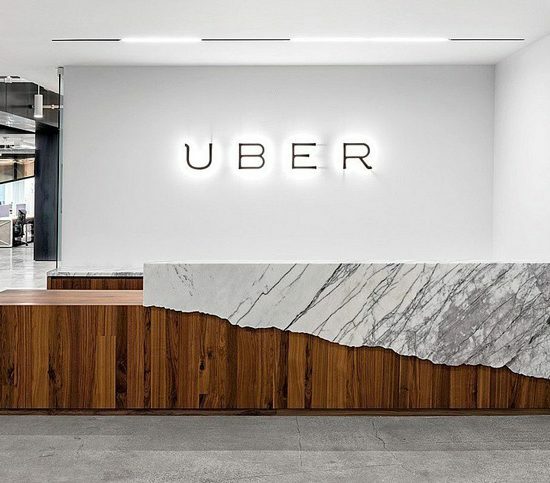 Over the past year, mature companies have been the ones soaking up SF’s office space rather than start ups. The Exchange, up till now with no tenants, was the fourth largest under construction or approved development without tenants. Developers and community organizers are being invited to pitch creative makeover ideas to the Port of San Francisco for eight piers on the city’s waterfront. The piers are known for their history in SF’s waterfront lore and shipping commerce. Piers 19, 23, 29, 31, 26, 28, 38 and 40 are now just parking areas for cars or lie fallow and empty. 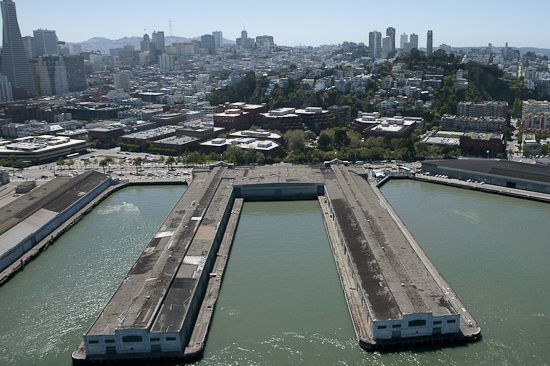 One promising note for the development is that the Port stated that ideas do not have be consistent with state public trust rules—thus, as the SF Chronicle reports, this makes the piers open to hotels, retail, housing or restaurants. 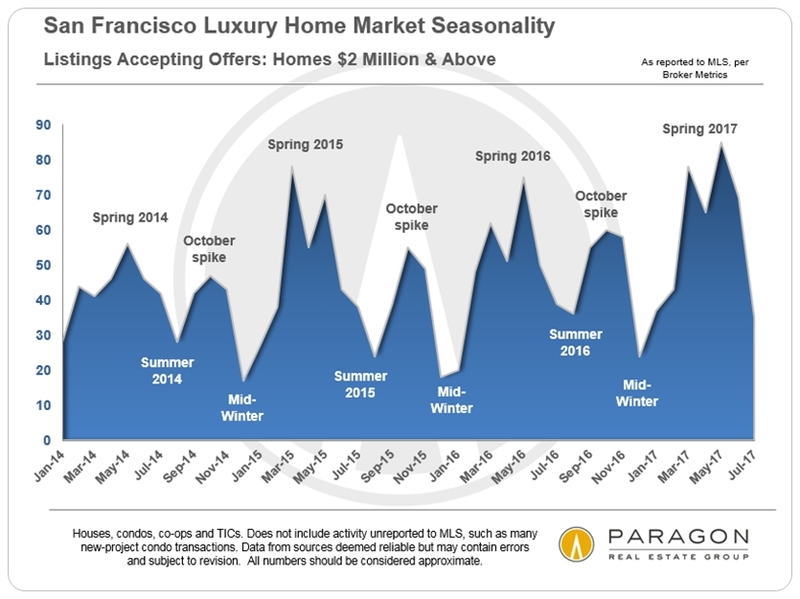 Year-over-year, a low inventory homes market dropped even lower, while buyer demand increased to keep the pot boiling in San Francisco through the third quarter, when activity typically cools down between the spring and autumn selling seasons. 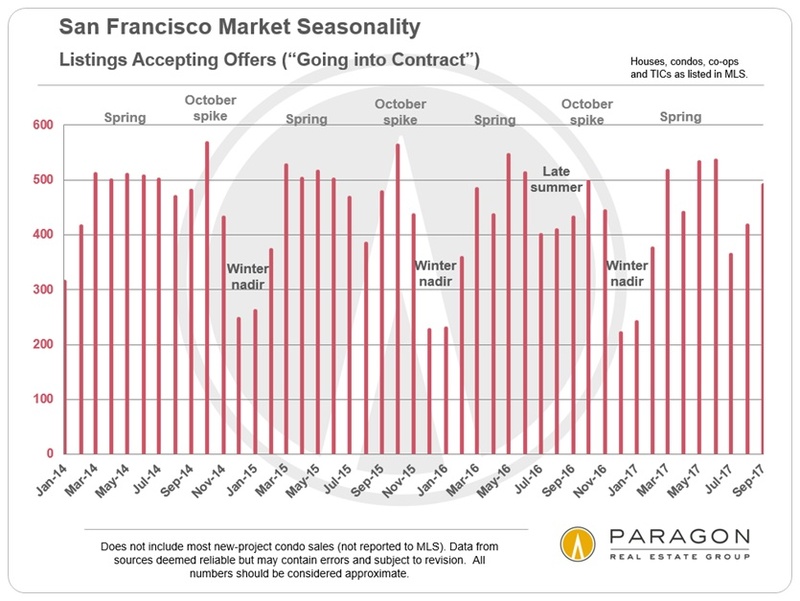 Since closed sales in each month mostly reflect the market heat in the previous month, when the offers are actually negotiated, we will not have hard data on September until October sales data becomes available in November. 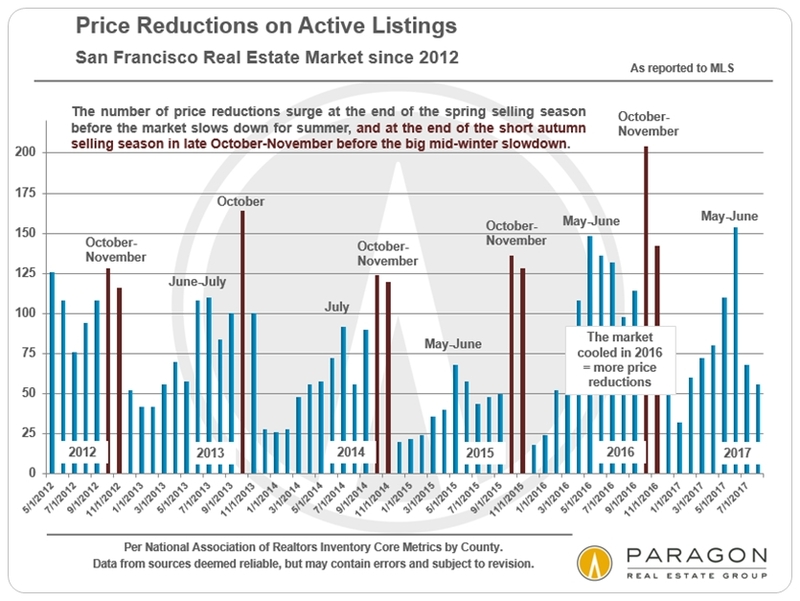 One thing we do know is that the number of new listings coming on market in September, which is usually the month of the year with the highest number of new listings, is down considerably from last year – but the number of listings accepting offers increased: Less inventory, but more demand. 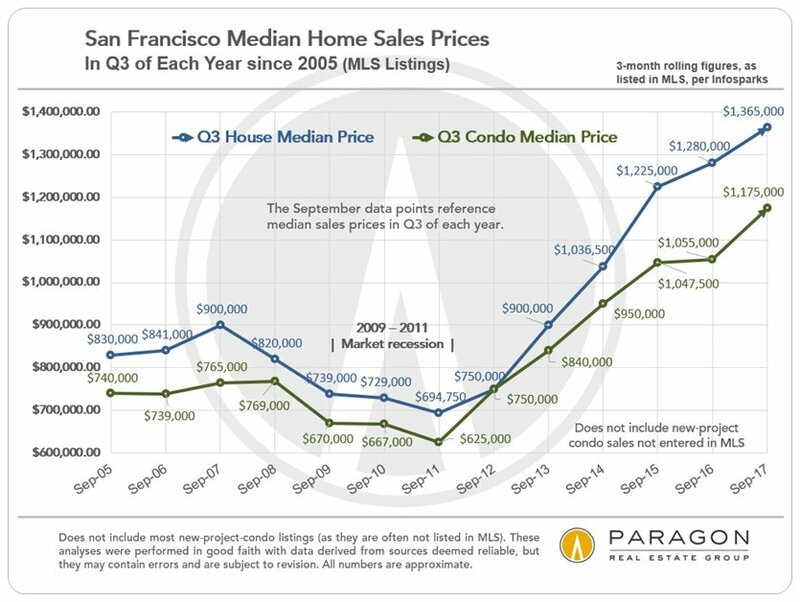 The Q3 SF median house sales price was $1,365,000 and the median SF condo sales price was $1,175,000, considerable year-over-year increases over Q3 2016 prices: 7% and 11% respectively. 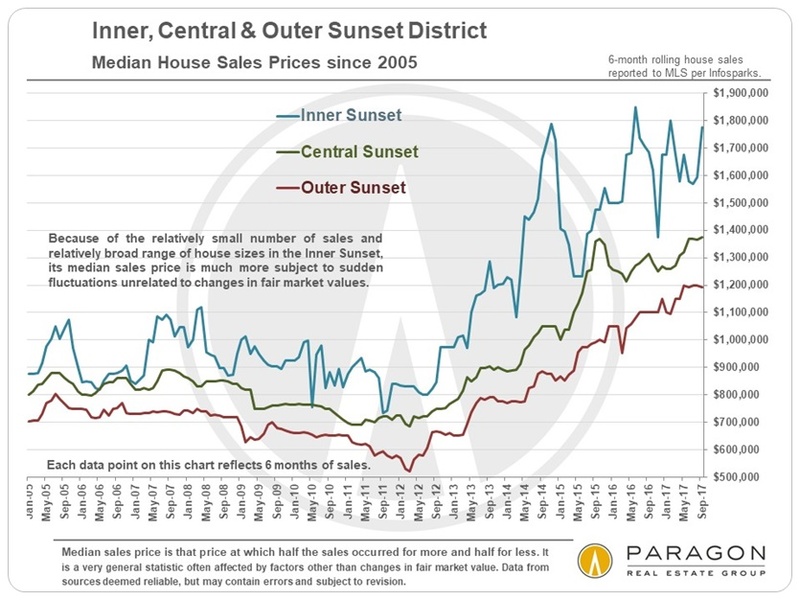 It is not unusual for median prices to drop from Q2 to Q3, to a large degree due to the seasonal decline in luxury home sales, as well as the typical overall market cooling during the summer, and this occurred for houses, which dropped $75,000 from Q2, similar to drops in previous years. 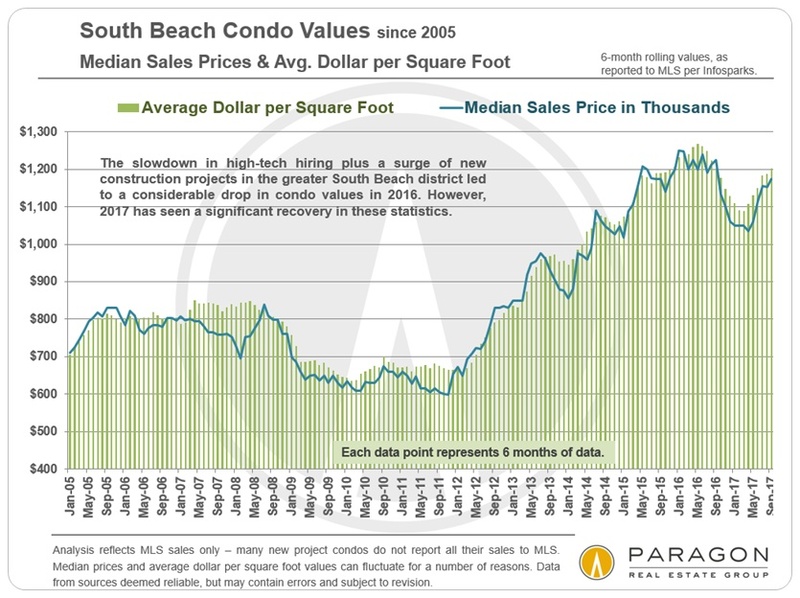 But condos bucked this trend and increased $40,000 quarter to quarter. (Q2 to Q3 change is not illustrated on this chart.) 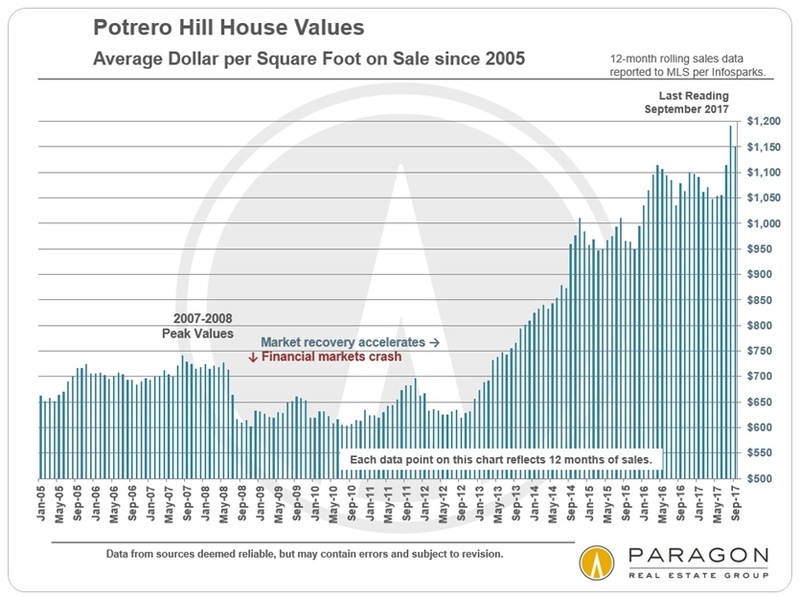 However, while the house inventory in the city has been relatively unchanged for 60+ years, tens of thousands of new condos have come into the market over recent decades, which means that comparing the basket of sales in different periods is not always apples to apples. 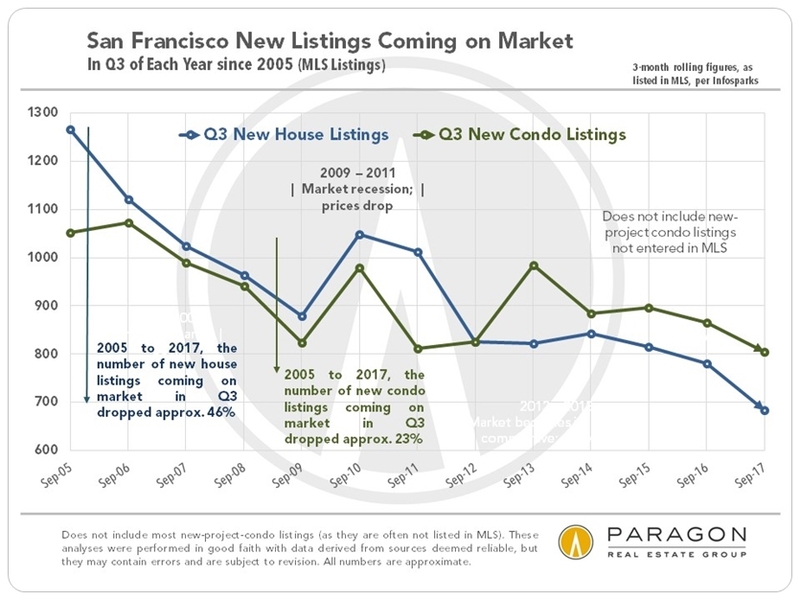 New listings hitting the market dropped appreciably year-over-year, doing no favors for buyers competing for homes in Q3 overall, and in September specifically. 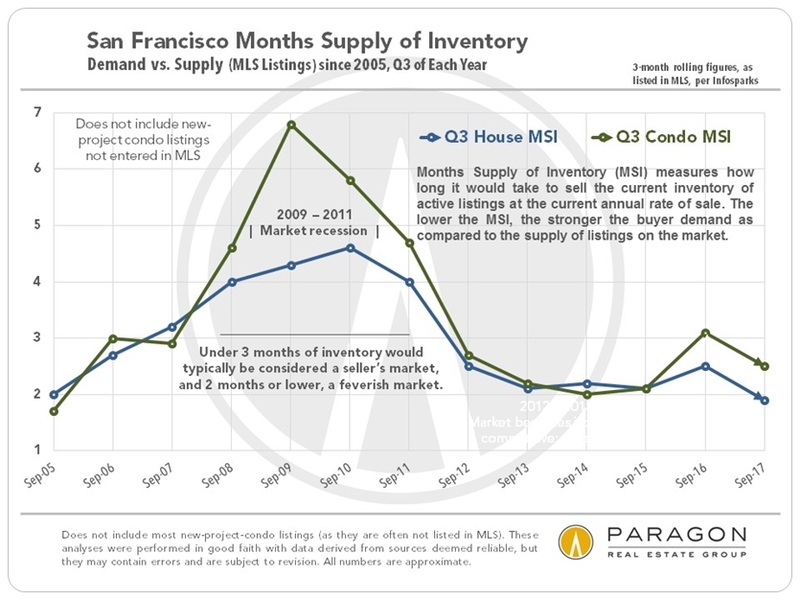 MSI compares demand to supply in one statistic: The lower the MSI, the higher the demand vs. the number of listings available to purchase. 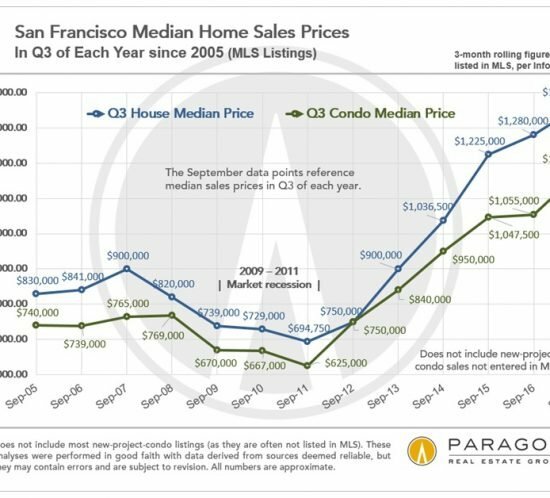 The MSI for the SF house market in Q3 2017 was as low as in any Q3 during the past 12 years. 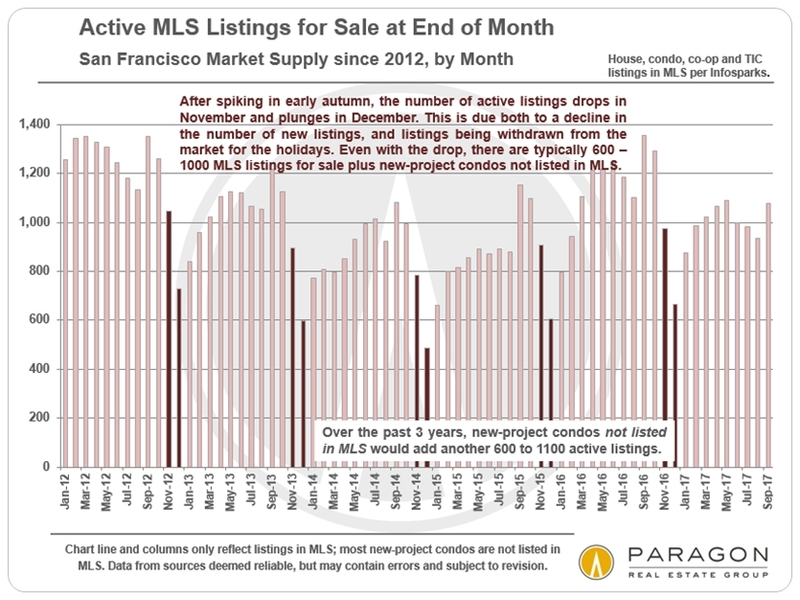 For San Francisco condos, the MSI was somewhat higher, but still historically low (but does not include the substantial inventory of new-project condo listings, not listed in MLS). Both are down significantly from Q3 of 2016: 2016 was a cooler market between two very hot markets in 2015 and 2017. 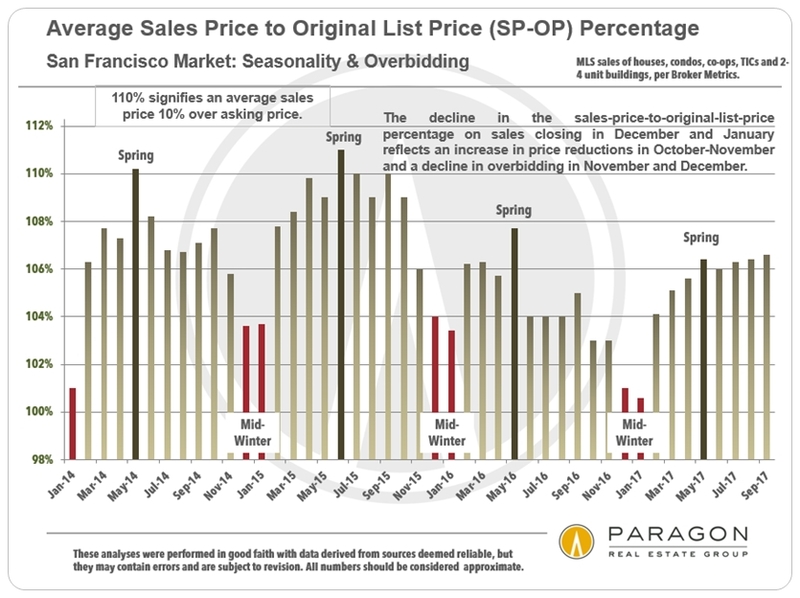 In the last 6 years, overbidding percentages have usually declined from the Q2 spring selling season to the quieter Q3 summer market. But not this year: This year overbidding increased in July and September to their highest points since mid-2015. 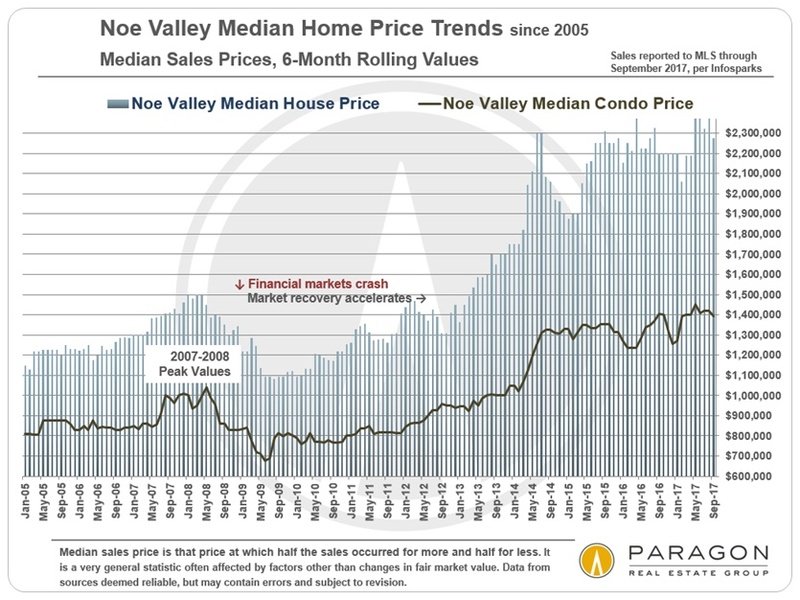 We recently completed a report placing the Bay Area housing market within the context of a wide variety of other economic and demographic dynamics, such as population growth, employment and hiring, the stock and the IPO markets, consumer confidence, interest rates, commercial lease rates, , aging homeowners (who sell less frequently), housing affordability and new housing construction. Because conditions, trends and cycles seen among them are, more often than not, closely interrelated. The full report is online here: Economic Context Report. 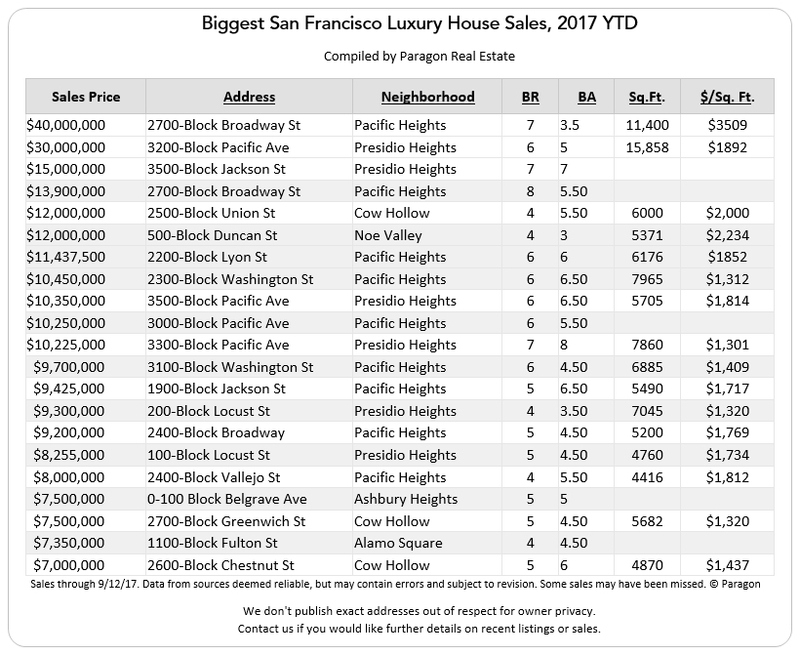 We have dozens of analyses of appreciation trends within specific SF neighborhoods and districts, and below is a sampling, some by median sales price and others by average dollar per square foot value. 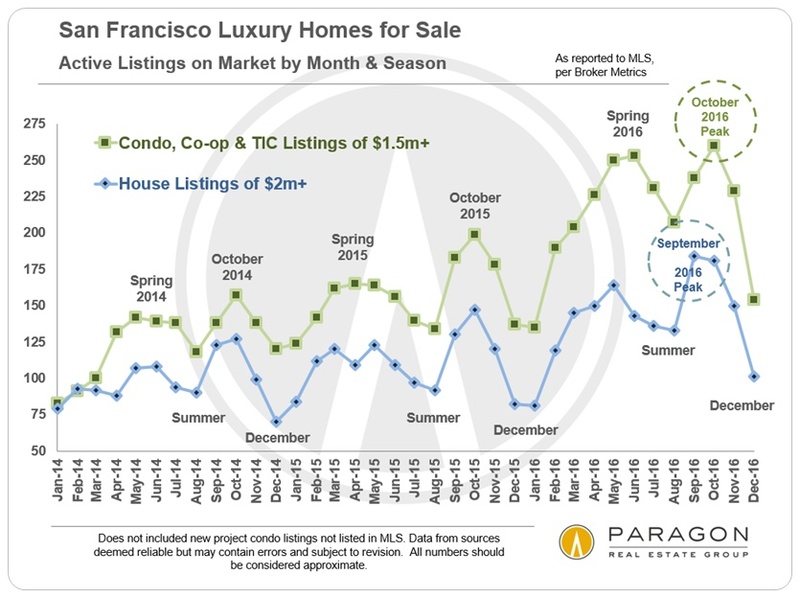 Some city neighborhoods plateaued or saw declines in values in 2016, when segments of the market distinctly cooled: Generally speaking, these were more expensive home segments, and condo markets most impacted by new-project condos coming on market with major new supply. Affordable house markets largely continued to appreciate in 2016. In 2017 to date, most areas of the city have experienced further appreciation. 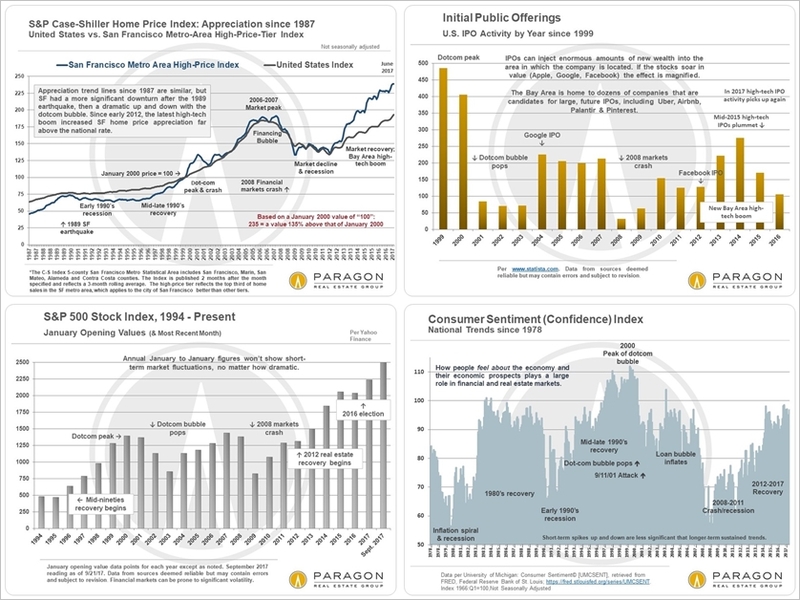 Changes in these statistics do not necessarily correspond exactly to changes in fair market value, as they can be affected by a variety of factors. 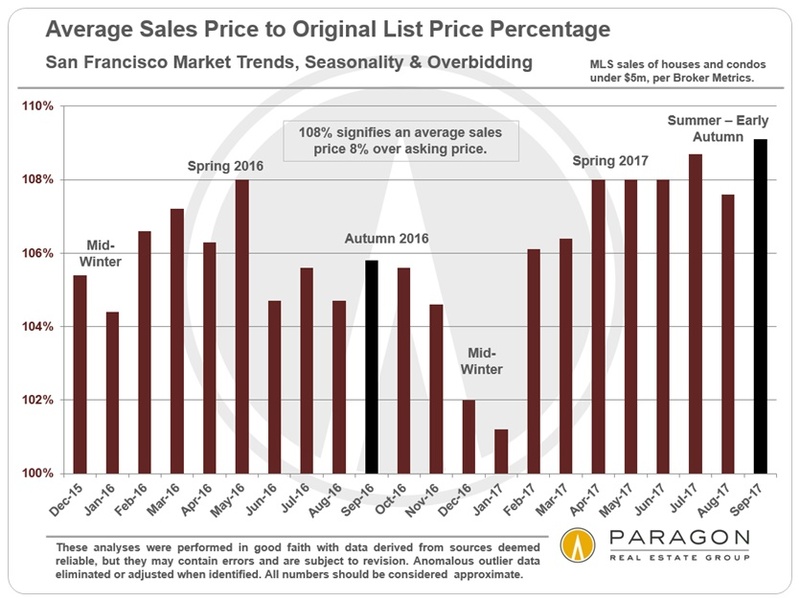 Neighborhoods with relatively few sales and broader ranges in individual sales prices are most prone to fluctuations unrelated to changes in fair market value. Longer-term trends are always more meaningful than shorter term. If you are interested in a neighborhood not included below, please let us know.